Today Room 10 created circles with different radius lengths using compasses to create ANZAC poppies. We found it challenging to construct the circles. Some found that if you moved the paper around, that made it easier. Some found the bigger circles were easier to construct than the very small ones. 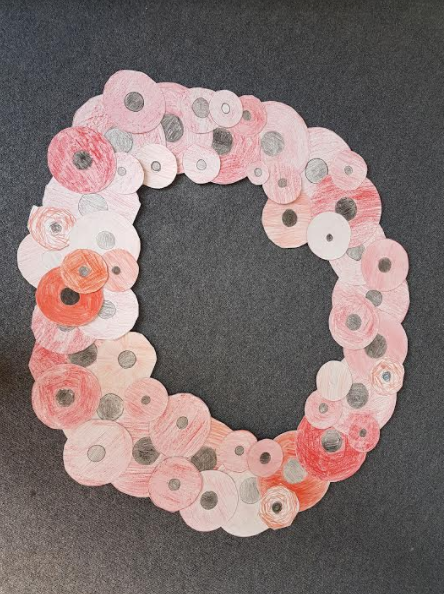 We had to make poppy flowers that were small, medium and large. The small poppy had an outer circle with the radius of 5cm and an inner circle of 1cm. The medium poppy had an outer circle of 7cm and an inner circle of 2cm. The large poppy had an outer circle radius of 10cm and and inner circle radius of 3cm. We learnt that poppies are significant symbols of remembrance during ANZAC commemorations as they were the first flowers to bloom on battle grounds, so for us left behind, they can also represent a new start or new growth and that we should try our best to live as our soldiers fought so hard to give us our fresh starts and freedom we enjoy today.